​Book at least 24 hours in advance at Save up to 20% on your Aquaventure Waterpark entry. Splash into a world of excitement at Aquaventure Waterpark Dubai Experience the Middle East and Europe’s No. 1 water park, over flowing with 17 fun-filled hectares of adrenaline pumping fun. Enjoy 12 months of unlimited access to Aquaventure Waterpark when you purchase an Annual Pass. Want us to notify you when we add new coupons and deals for Atlantis The Palm? Stay in Atlantis The Palm, Dubai and join in some amazing activities the kids will never forget, including the biggest Egg Hunt with over 50,000 eggs! Along with a host of eggciting Easter activities, enjoy complimentary unlimited access to Aquaventure Waterpark, The Lost Chambers Aquarium, a complimentary session at Atlantis Kids Club or The Zone. For more information or to book, call +971 4 426 1030 or visit one of our Resort Activity Booking Points. Bookings must be made at least 14 days in advance to avail this offer Full prepayment is required at the time of booking and is non-changeable and non-refundable. Offer available when you book online. Get the adrenaline pumping with record breaking rides and slides, get up close and personal with sharks and rays or kick back and relax on 700 metres of pristine private beach or in the new exclusive reserved seating areas. Come and get your thrills, spills and divine relaxation at the best water park in Dubai, Aquaventure Waterpark. Enjoy unlimited access to Aquaventure Waterpark and a variety of member benefits including preferential rates at Dolphin Bay and Sea Lion Point, discounts at The Lost Chambers Aquarium and much more! 20% discount on Aquaventure Waterpark retail outlets Complimentary valet parking * Guests who purchase Child Rate must be less than 1.2 meters. Ever dreamt of getting unlimited access to the region's top ranked waterpark filled with world record-breaking water slides and 700m of private beach line? Now is your chance with this limited time 3-Month-Pass offer at Aquaventure Waterpark - giving you 90 days of fun for the price of 1 general admission ticket. Grab your Season Pass now for only AED 295 (adults) and AED 225 (children 1.2m and below) and enjoy amazing marine & waterpark benefits for your friends & family. 20% off ** at The Lost Chambers Aquarium for up to 4 people including the Season Pass holder. 20% off ** at Aquaventure Waterpark for up to 3 Friends/Family members. Add a little luxury to your next holiday with up to 25% off Imperial Club which includes complimentary airport transfers, a concierge team and enjoy complimentary breakfast, afternoon tea and evening drinks in the newly designed exclusive Imperial Club lounge. You’ll also have complimentary access to a private beach, exclusively for our Imperial Club guests to soak in the sun, along with Kids Club access for the little ones. * Guests who purchase Child Rate must be less than 1.2 meters. If a Child ticket is purchased online and upon collection of annual pass card the guest is deemed to be above 1.2 meters they will be required to purchase the Regular Price Annual Pass at the ticketing gate. Please see full terms and conditions below prior to purchase. 20% off Club and Signature Suites, and triple Skywards Miles Kids Stay, Dine and Play for FREE throughout their holiday too. Breakfast, Lunch, and Dinner at selected restaurants* plus some amazing activities like Dolphin Encounters for FREE when accompanied by a full paying adult (kids aged 11 and below). You can choose from a variety of cafes and casual dining options within the resort. There are not too many destinations that give you the opportunity to make friends with dolphins, enjoy water adventures, and dine like a king or queen. But at Atlantis the Palm Dubai, you can do all this and more, especially when it comes to traveling the world with delicious cuisine. With over 20 restaurant and cafe options within the hotel, you can choose to eat from fine dining restaurants to family-friendly outlets. For a taste of the sea, you could book your reservation at Ossiano, where seafood treasures from azure waters are freshly sourced on to your tables. To get the taste of Middle Eastern street fares, head straight to Shawafel. While the options for dining are endless, the budget isn’t as accommodating. That’s why, CouponCodesMe has got the perfect solution for you! Use one of our exclusive Atlantis the Palm coupon code to get flat discounts on your adventure to the lost city of Atlantis! Scroll through our Atlantis coupon code offers to find deals that will help you save money while letting you enjoy without having to think about tiny budgets. Experience the pleasures of dining at one of the best hotels in Dubai with CouponCodesMe promo code deals today. 1. Login to CouponCodesMe. Additionally you could also subscribe to CouponCodesMe newsletter to receive trending offers in your mailbox. Copy the relevant Tavola coupon code. 2. Visit the official website of Atlantis the Palm and find an assortment of activities to choose from. Make your hotel room booking, restaurant reservation and more. 3. Use the promo code during checkout to ensure that you get your deal. 4. Pay as usual and get your outfits ready for a fun dining experience at Atlantis! How To Use Atlantis The Palm Coupon Code? Select Atlantis The Palm coupon code or discounts at CouponCodesME and click on it. Upon this, you would get the Atlantis The Palm code or will be guided appropriately for the next step and Atlantis The Palm would open in the next tab. Copy the code with a single click. After going to the Atlantis The Palm website, book from a wide range of rooms and day activities available at the resort. Select any one of them and click on it to start the booking process. Read the details of the room/activity you selected. Check for its price and book it. Apply Atlantis The Palm coupon code and redeem it to get the best discounts on your bookings available at CouponCodesME. You can see the price deduction by using the Atlantis The Palm coupon code. Enter the basic information like name, email, booking date and contact number for initial details and booking purpose. Review the booking summary in detail. Remember, it is the final time you are going to review it. Once you are done, press confirm to complete your booking steps. Enjoy your booking experience at Atlantis The Palm using coupon codes and deals available at CouponCodesME. We have 12 Atlantis The Palm deals for you to choose from including 12 Offer. We have a dedicated team searching for the latest Atlantis The Palm coupons and Atlantis The Palm codes. Simply enter the Atlantis The Palm promo code at checkout and save money today. Find the best offers at CouponCodesME for atlantisthepalm, remember to check us regularly before buying online to get Atlantis The Palm vouchers. Enjoy your saving on Atlantis The Palm discounts and printable coupons online. Atlantis, The Palm opened in September 2008, and spans a massive 46 hectares, with 17 hectares of water park alone. Atlantis also features exciting marine and entertainment attractions that the whole family can enjoy, and a collection of world-renowned and award-winning restaurants. From the moment you arrive, you will be immersed in a dazzling world of imagination, pleasure and luxury. The Atlantis beach resort is an aquatic wonderland by the sea offering relaxation and thrills for couples and families alike. From the hotel architecture to the award-winning restaurants and must-visit aquatic attractions. Each Atlantis room and suite at is designed to immerse our guests in absolute comfort and unparalleled luxury. Complete with spectacular views of the azure waters of the Arabian Sea, or across our beach and over the iconic Palm and magnificent Dubai skyline. Reside in one of the hotel’s rooms or suites which include our famous Signature Underwater Suite. Imagine waking up to a breath-taking view of the ancient ruins of the mythical lost city of Atlantis and its marine inhabitants. Atlantis is also home to 65,000 marine animals, which you’ll find in unique marine habitats at The Lost Chambers Aquarium. You can also get up close and personal with the dolphins at Dolphin Bay, learn to scuba dive and swim with sharks at the Atlantis Dive Centre, or experience the number one water park in the Middle East and Europe, Aquaventure Waterpark. Spread over 17 hectares, there is plenty of fun to be had for the whole family. 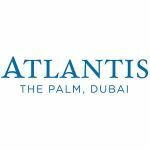 Atlantis The Palm Coupon Code ? You can enter the code here or read our full detailed Atlantis The Palm Coupon Code help guide below. Look for both Atlantis The Palm Company coupon codes AND online sales. You can save more money when stores let you stack codes on top of sales.